Miltoncontact: Who is Dame Evelyn Glennie? I counted myself lucky to still get a ticket to see Dame Evelyn Glennie, the world renowned musician, give a motivational speech at the joint Business Club / Inspired Group event last night. I was not disappointed as she riveted us in a marimba accompanied journey. All this in support of three charities, East Anglia Childrens Hospices, Scotsdales Charitable Foundation and Able Child Africa. It began with visiting schools and helping ignite the musical sparks in the young. As her career as a musician grew, Evelyn also expanded her motivational skills to encompass all walks of life, all ages. She is now equally renowned internationally for her motivational talks as her musical ability. As a member of the Hunts Speakers (part of Toastmasters International) I was impressed not only with her incredible lack of “ums” and “ers” but also with the fantastic vocal variety, passion and enthusiasm with which she talked. 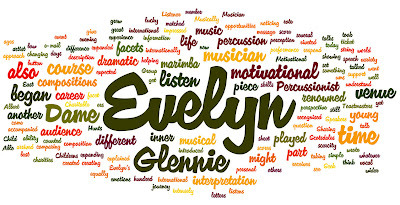 But who/what IS Dame Evelyn Glennie? Why the question marks for her different facets above? They are boxes. The undercurrent of both Evelyn's talk and the passionate presentation was; Whatever simple description for her or set of facets that you apply; They are merely pigeon-holes. Dame Evelyn Glennie is herself, and she is constantly changing. For me personally, the message at the end of the evening was: Be yourself; Seek out new challenges; Do your best. It sounds as if it was an inspirational evening Chris. Thank you for sharing it. Thanks Clare, it was AND Dame EG retweetet the blog article!! !